Thank you for your interest in our company and enjoy browsing! Flood victim of Hurricane Sandy? FACTORY DIRECT DROP AND SET PACKAGES AND PRICING! This will to get you back on your feet as quickly as possible! These special floor plans and packages can allow you to be your own General Contractor or Project Manager, which can save you thousands in the total of your project or home in the end. Take advantage of our SPECIAL DROP AND SET PRICING today, please feel free to call 609.693.8881 and schedule your free consultation appointment today with Vincent Simonelli - Premier Modular Homes located at 884 Route 9 North, Little Egg Harbor, NJ 08087, USA! We care about your wants and needs as residents and recent hurricane victims! Please feel free to stop in at any time to discuss your current situation and what your next plan should be. We look forward to serving and assisting you smoothly into your new home and residence. God bless United States and all the families, volunteers and personnel who endured Hurricane Sandy! 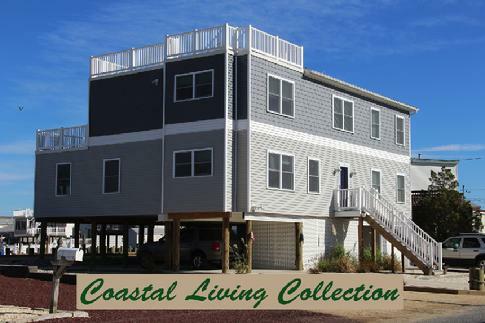 Visit our Coastal Living Collection now! Click the image below for beautiful shore homes and floor plans and take advantage of our special Hurricane Sandy pricing, these can also be altered or tailored to your needs and specifications! As a family run company, we believe in the integrity and value of the products and materials used in the building of your home. We offer many different modular home manufacturing companies that provide exceptional services and a fantastic product line, and we feature these particular brands of whom we have developed a strong relationship between initial planning to execution and final stages. We have proudly joined forces with these companies and stand proud and behind the craftsmanship and value of these homes: Signature Building Systems, Inc., has made it their mission "to provide greater flexibility and personalization in the modular housing industry while saving customers both time and money. We pride ourselves on building affordable, high-quality homes that are going to meet the needs and lifestyles of today's homebuilders." Premier Modular Homes offer several different services, ranging from Turn Key operations, drop and set packages, and Building Consultation service. We can also offer full contracting and sub contracting services, custom homes and renovations, site management, and property management. Turn Key Operation - We do the whole job on your lot! A complete turnkey home custom tailored to your needs and desires. From simple to complex Premier handles it all for you at the best possible square foot price we can offer. Building Consultation Services - If you would like to build on your lot, and are unsure how to do this and get started, we can help. Feel free to call anytime to schedule a meet and greet. We can walk you through any stages of the building process from obtaining permits to pointing you in the proper direction for a successful completed operation. Custom Homes, Construction, and Renovations - We also can build your dreams conventional stick- frame style as well. We have a beautiful portfolio of previous completed jobs, including unique kitchens and bathroom renovations, breathtaking additions, beautiful trim, wood-working, and cabinetry, basement and garage conversions, as well as all phases of interior and exterior contracting: siding, windows, wrap around decks and porches, aluminum renovations, concrete sub-floors and pads, etc. Please inquire about all services we can offer, or we will direct you to someone who can help. New Jersey on Long Beach Island, Beach Haven West, Tuckerton Beach, Little Egg Harbor, Manahawkin, Sea Isle City, Avalon, Forked River, Tom's River, Margate, Ventnor, Surf City, Ship Bottom, Beach Haven, Barnegat Light, Harvey's Cedars, Atlantic City, Ortley Beach, Seaside Heights, Lanoka Harbor, Lavallete, Red Bank and all surrounding in-land vicinities including Millville, Vineland, all of Ocean County, Mercer County, Cumberland County and southern New Jersey. We now proudly offer services to beautiful Bucks County and Montgomery County, Pennsylvania as well.